(Nanowerk News) In one sense, our hands define our humanity. Our opposable thumbs and our hands' unique structure allow us to write, paint, and play the piano. Those who lose their hands as a result of accident, conflict or disease often feel they've lost more than mere utility. A new invention from Tel Aviv University researchers may change that. Prof. Yosi Shacham-Diamand of TAU's Department of Engineering, working with a team of European Union scientists, has successfully wired a state-of-the-art artificial hand to existing nerve endings in the stump of a severed arm. The device, called SmartHand, resembles — in function, sensitivity and appearance — a real hand. Robin af Ekenstam of Sweden, the project's first human subject, has not only been able to complete extremely complicated tasks like eating and writing, he reports he is also able to "feel" his fingers once again. In short, Prof. Shacham-Diamand and his team have seamlessly rewired Ekenstam's mind to his SmartHand. Prof. Shacham-Diamand's contribution to the project, on which TAU collaborated with Sweden's Lund University, is the interface between the body's nerves and the device's electronics. "Perfectly good nerve endings remain at the stem of a severed limb," the researcher says. "Our team is building the interface between the device and the nerves in the arm, connecting cognitive neuroscience with state-of-the-art information technologies." Prof. Shacham-Diamand runs one of the top labs in the world for nano-bio-interfacing science: the Department of Electrical Engineering — Physical Electronics Lab under the Bernard L. Schwartz Chair for Nano-scale Information Technologies. "Our challenge," remarks Prof. Shacham-Diamand, "was to make an electrode that was not only flexible, but could be implanted in the human body and function properly for at least 20 years." The artificial SmartHand, built by a team of top European Union scientists, will belong to Ekenstam, the test subject, as long as he wishes. "After only a few training sessions, he is operating the artificial hand as though it's his own," says Prof. Shacham-Diamand. "We've built in tactile sensors too, so the information transfer goes two ways. These allow Ekenstam to do difficult tasks like eating and writing." Ekenstam told a television interviewer, "I am using muscles which I haven't used for years. I grab something hard, and then I can feel it in the fingertips, which is strange, as I don't have them anymore. It's amazing." This particular multi-million dollar project focused on hands, but the TAU/EU team could also have built bionic legs to be wired to the brain. The team first chose to build a hand, however, because of its unique challenges. "The fingers in the hand are the most complex appendages we have," Prof. Shacham-Diamand observes. "The brain needs to synchronise the movement of each digit in a very complicated way." 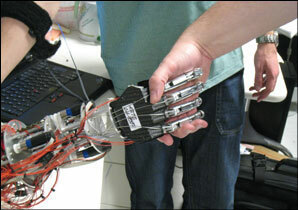 With the help of the TAU team, the SmartHand project was able to integrate recent advances in today's "intelligent" prosthetic hands with all the basic features of a flesh-and-blood hand. Four electric motors and 40 sensors are activated when the SmartHand touches an object, not only replicating the movement of a human hand, but also providing the wearer with a sensation of feeling and touch. While the prototype looks very "bionic" now, in the future SmartHand scientists plan to equip it with artificial skin that will give the brain even more tactile feedback. The researchers will also study amputees equipped with the SmartHand to understand how to improve the device over time. The SmartHand project is funded by the E.U. Sixth Framework Programme. TAU's SmartHand partners include ARTS Lab, Scuola Superiore Sant'Anna (Italy), Aalborg University (Denmark), Tyndall Institute (Ireland), Össur (Iceland) and SciTech Link HB (Sweden).